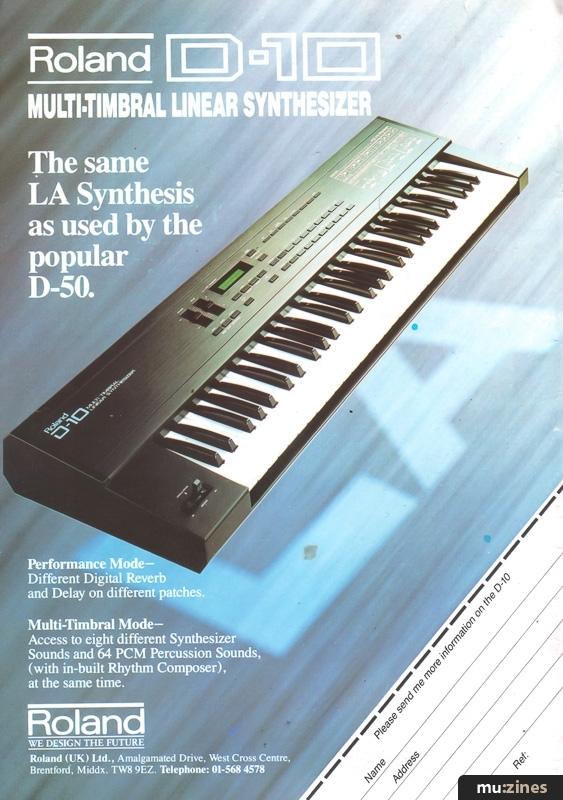 Second generation D-50 style synthesis. The D-10 is a Digital Linear Arithmetic Synthesizer and the D-110 is its upgraded rackmount version. Capable of decent acoustic sounds and great new synth-type sounds the D-10/110 is a great and cheaper alternative to the popular D-50. It has a confusing synthesis / editing method composed of tones, partials and timbres. Basically it all boils down to tricky programming which, if you know what your doing, can have interesting and unique results. On-board drum sounds, reverb effects and internal / external memory storage are also a plus. The D-110 rackmount version adds 6 individual outputs, and the follow-up D-20 keyboard version adds an 8-track sequencer. Definitely worth a listen for any musician on a budget! It has been used by Suzanne Vega, Future Sound of London, and Information Society.